This is what Erin and I had to go through as part of our latest television show which airs this weekend on Discovery Channel. The blue Avatar suits are to protect us from deadly box jellyfish while carrying a saltwater crocodile, which sounds more dangerous on paper than it actually was. The show is called "Croc Attack" which, amazingly enough, has never actually been used as the title for a TV show about crocodiles before. For some reason which I can't quite put my finger on, it's airing as part of Shark Week. Hey, if you don't tell anyone, I won't either, ok? It's on at 9pm ET/PT Saturday 7th August, 12am ET/PT Sunday 8th August and 6pm ET/PT Sunday 8th August. If enough people watch the show, and I hope you all do, we'll get to do more! It's our quest to get a bit more science and interesting stories in crocodile documentaries, which you know is the right way to go. If you're on the fence about it, bear in mind it features Smaug at 1,000 frames per second. He looks great at that frame rate. Setting the TiVo as we speak, and passing the word around to several friends. Sounds like fun!! Hello. I just watched almost all of your show...we got home after it had begun. PLEASE tell me there was made SOME mention of the tremendous work done by Steve Irwin and his family. If absolutely no mention was made of them--it's atrocious. 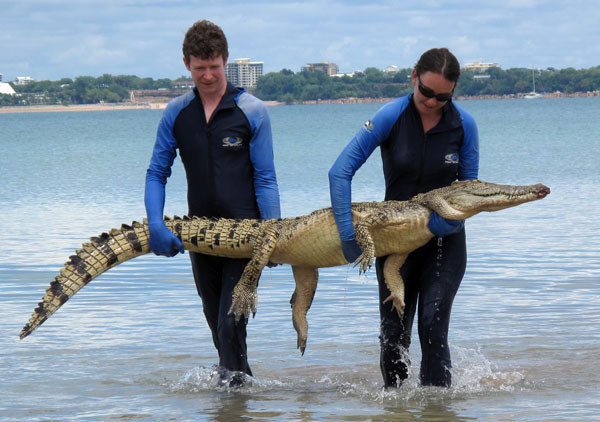 I kept expecting something ANYthing to be said--after all, Steve caught, moved and released and satellite tagged saltwater crocs for how many years?? Were you not following up on techniques he and his teams had come up with??? I REALLY hope that we missed some credit being given where it's overwhelmingly due. Steve Irwin had nothing at all to do with this study. He was working in Queensland on a separate project. This satellite tracking project started in the Northern Territory around the same time as Steve's project, although it was a continuation of work that's been ongoing here since the mid 1970s (before I was involved obviously). We had a completely different objective to Steve's project - ours was focused on improving safety for people and reducing the risk of crocodile attacks. No, we weren't using any of Steve's "techniques" - we developed our own quite independently, and a lot was based on experience picked up by many people over the years. In fact the satellite tag that was used in the show is a completely new design (there's a lot they didn't explain about it). There's no need to get so upset. The guys in Queensland have done some fine work over the years and I'm sure plenty of shows have highlighted that in the past, but this was really quite different. You may have missed the start of the show which was discussing the conflict between people and crocodiles around Darwin. They better replay it! I've been hoping for some more science oriented programming to relieve all of these educational networks from the ghetto of reality TV. I'm not sure how it is here in Aussie but in the US Discovery & Animal Planet are nearly 90% reality television. Some of it is fun...but what ever happened to "Wild Discovery"? Sounds like you're pointing them in the right direction...hopefully they listen.